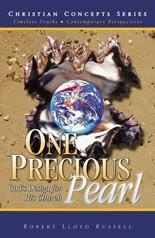 In His book, “One Precious Pearl”, Author Robert Lloyd Russell presents an enlightening, fascinating and enriching study of the parable of the “one pearl of great price” found in Matthew 13. The Author succinctly gives first an overview of the seven well-known parables of Matthew 13, then focuses in on the parallels of the “one pearl of great price”, revealing an in-depth study as to why Christ used the pearl in the parable. After reading this book, you will never look, nor gaze, at a pearl in the same way. Nor will you ever view the Church in the same way. Author, Robert Lloyd Russell reveals a captivating, spiritual truth as demonstrated by Christ through the parable of the one pearl of great price. A pearl is of great significance and value. This in depth study and comparison will cause you to truly appreciate the kingdom of heaven that you have the privilege of belonging to and open your eyes to the free gift of salvation causing a new meaning to come forth about what exactly it means to be a Christ follower and to be a part of His true church. Some may ask, “What is His true Church?” This book explains just that and will give you a deeper knowledge and understanding of what it is to be a part of His true Church, inspiring you to the reality of the kingdom of heaven and what God’s design is for His Church really is. Oh, and what a precious pearl the Church truly is! This book is revolutionary in that not only does it lay out the parallels between the true Church and the pearl in such an undeniable way, the significant analogies give light to the fact that the cross gave birth to the Church. The author leaves you in awe to the new realization of why exactly Christ used an example of the pearl. Founded and built upon scripture, never before has a teaching split open the truth of the reality of the parable of the,“ one pearl of great price” and the Church. “For by grace are ye saved through faith; and that not of yourselves: it is the gift of God, not of works, lest any man should boast” (Eph 2:8-9). This book comes highly recommended, is filled with scriptural applications, wisdom, wise counsel, encouragement and will bless the reader abundantly.